Displays a standard Open/Save dialog. An open dialog looks similar but doesn't have a text box for the file name. You can then call methods to indicate what directory to display, whether or not multiple selections are allowed, whether or not the user is allowed to open a directory, what target view to send send notifications, and more. See the constructor for details. You can modify the look of your BFilePanel object by calling the SetButtonLabel() and SetSaveText() methods. If you want to change the look even more radically you can get alter the panel's BWindow and BView objects. You get the window by calling the Window() method. With a pointer to the panel's BWindow object you can drill down to the various views contained therein. Once you have constructed and customized your BFilePanel object you should call the Show() method to display the panel to the user. When the user confirms or cancels a BMessage object is constructed and sent to the target of the BFilePanel object. You can specify a different target in the constructor or by calling the SetTarget() method. For open notifications the default target is be_app_messenger and is caught by the RefsReceived() method The what field is set to B_REFS_RECEIVED. You can set your own message by calling the SetMessage() method; in this case the message will be sent to the target's MessageReceived() method instead. Save notifications are always sent to the target's MessageReceived() method unlike open notifications. The what field of the message is set to B_SAVE_REQUESTED. The directory field contain a single entry_ref structure that points to the directory that the entry is saved to. The text that the user typed in the save panel's text view is put in the name field and is of type B_STRING_TYPE. Cancel notifications are sent when the panel is hidden whether by the user clicking the cancel button, closing the dialog, or confirming the action (assuming hide-when-done is turned on). Cancel notifications can be caught by the MessageReceived() method of the target. The what field is set to B_CANCEL. The old_what field is set to the previous what value which is useful if you have overridden the default message. The what field of the message you sent is put in the old_what field. The source field is a pointer of B_POINTER_TYPE to the closed BFilePanel object. When the BFilePanel object is closed it is not destroyed, it is hidden instead. You can then delete the BFilePanel object or leave it be and simply call Show() to use the panel next time you need it. Creates and initializes a BFilePanel object. The constructor has many parameters but they may generally be set after the object has been constructed. The only parameters that must be set during construction are the mode, nodeFlavors, multipleSelection, and modal parameters. The rest may be set after the object has been constructed by the SetTarget(), SetPanelDirectory(), SetMessage(), SetRefFilter(), and SetHideWhenDone() methods. mode Set to B_OPEN_PANEL for an open panal or B_SAVE_PANEL for a save panel. Default is B_OPEN_PANEL. target The BMessenger object that sends messages to the BLooper or BHandler controlled by the file panel. ref The directory to display, by default the current working directory. nodeFlavors One or more option flags, this applies to open panels only. B_FILE_NODE Can select files and symlinks to files. B_DIRECTORY_NODE Can select directories and symlinks to directories. B_SYMLINK_NODE Can select symlinks only. multipleSelection Whether or not the user is allowed to select more than one item to open. Save panels should always set this to false. message Message sent by the file panel on confirms or cancels. filter Hook method to call. modal Whether or not the panel is modal, defaults to false. hideWhenDone Set to false to keep the panel even after the user confirms or cancels. The close button will hide the panel regardless. Destroys the file panel object. If file panel is currently being displayed it is closed. The BRefFilter object references by this panel is not destroyed by this method. Sets the ref pointer to the next entry in the directory. B_ERROR Couldn't attain a lock on the window. B_ENTRY_NOT_FOUND End of the entry list. Gets the entry ref of the panel and sets ref to point to it. ref The entry_ref pointer you want set. Gets whether or not the panel should hide on confirm or cancel. Panel always hides if the user clicks the window's close button. true if panel will hide, false if panel will not hide. Determines whether or not the file panel is shown. true if visible, false if hidden. Gets the panel's target messenger object. The BMessenger object that sends messages for this panel. Gets the panel mode, either B_OPEN_PANEL or B_SAVE_PANEL. B_OPEN_PANEL if the panel is an open panel, or B_SAVE_PANEL if the panel is a save panel. Gets the BRefFilter object associated with the panel. The BRefFilter set to the panel. Refresh the directory or the panel causing the entries to be re-run through the BRefFilter::Filter() method. Sets the entry ref back to the top of the list. Hook method that gets called when the entry ref references by the file panel changes. Sends the message to the target BHandler messenger. messenger The target BHandler to send the message to. message The message to send. Set the button label specified by button to text. button The button to set the label of. text The text to set the button label to. Sets whether or not the panel should hide on confirm or cancel. on true to hide, false to not hide when done. message The BMessage object to send on confirm. Sets the entry ref of the panel to the directory referenced by entry. entry The BEntry object pointing to the desired directory. Sets the entry ref of the panel to the directory referenced by dir. dir The BDirectory object pointing to the desired directory. Sets the entry ref of the panel to the directory contained by ref. ref The entry contained by the desired panel directory. Sets the entry ref of the panel to the directory referenced by path. path The path of the desired directory. Sets the BRefFilter used by the panel to filter entries. filter The BRefFilter object to set. Set some save text to display in the save dialog. text The text to display. target the target BMessenger object to set. 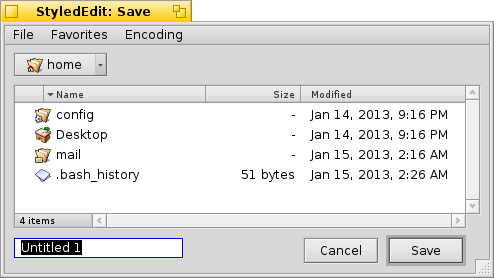 Displays the file panel on screen. Hook method that gets called when the file panel is hidden due to a user action. WasHidden() is not called if you call Hide() manually. Gets a pointer to the BWindow object used by the file panel. A pointer to the BWindow object used by the file panel.